Tinder Boost will be available to Tinder Plus members for free, the company’s premium service that requires a monthly fee. It will also be available to standard users for a charge. 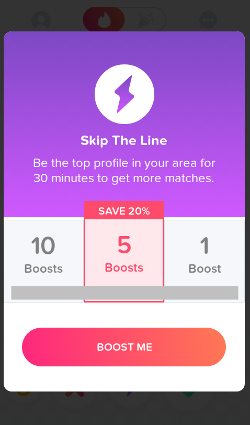 Right now, prices are being tested but on average will cost between $1.99 to $3.99 per Boost. If you buy packages of Boosts, then you get a discount based on the volume. Tinder Boost launched worldwide in November of 2016, but was tested in advance in Australia and UK markets. Company executives expect this new feature to help with an already impressive trend of revenue growth. Tinder added 284,000 paid subscribers in the third quarter of 2016 alone, bringing its paid service to 1.5 million users, according to Business Insider. People are willing to pay for the premium offerings, despite the initial backlash from Tinder’s controversial policy of charging members over the age of 30 more than its younger users. The number of paid memberships was ahead of projections from Wall Street analysts, which suggest that Tinder’s share of the market remains strong. However, apps like Hinge and Coffee Meets Bagel are marketing overtime to differentiate themselves from Tinder’s casual, “hook-up” reputation, so it remains to be seen if Tinder’s market share will decrease over time in favor of apps for more serious daters. Still, it seems that numbers mean something, and many daters prefer a wider pool when it comes to dating apps. Tinder continues to grow its revenue and market share, but its parent company Match Group continues to struggle with overall revenue growth. The most recent revenue report fell below expectations. It remains to be seen if Tinder’s new features will help the company as a whole, but so far this year, they are moving in the right direction.